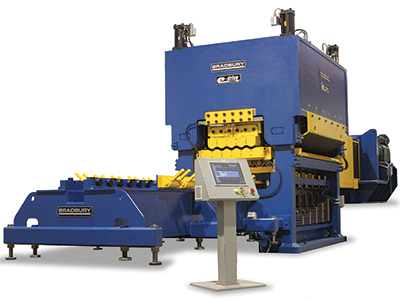 Bradbury will present its automated e-Drive leveling systems to the FABTECH crowd, showcasing a setup that reads the shape of the strip and automatically initiates the leveler to self-adjust. This new system uses I-unit monitoring and improvement to automatically correct for shape changes throughout an entire coil. Development of worldclass controls and a unique set of options, including the exclusive e-Drive, make the levelers easy to operate, productive and energy efficient, while maintaining control of tension and flatness repeatability.